Updated on 4/19/18: Included cover design and liner note credits. 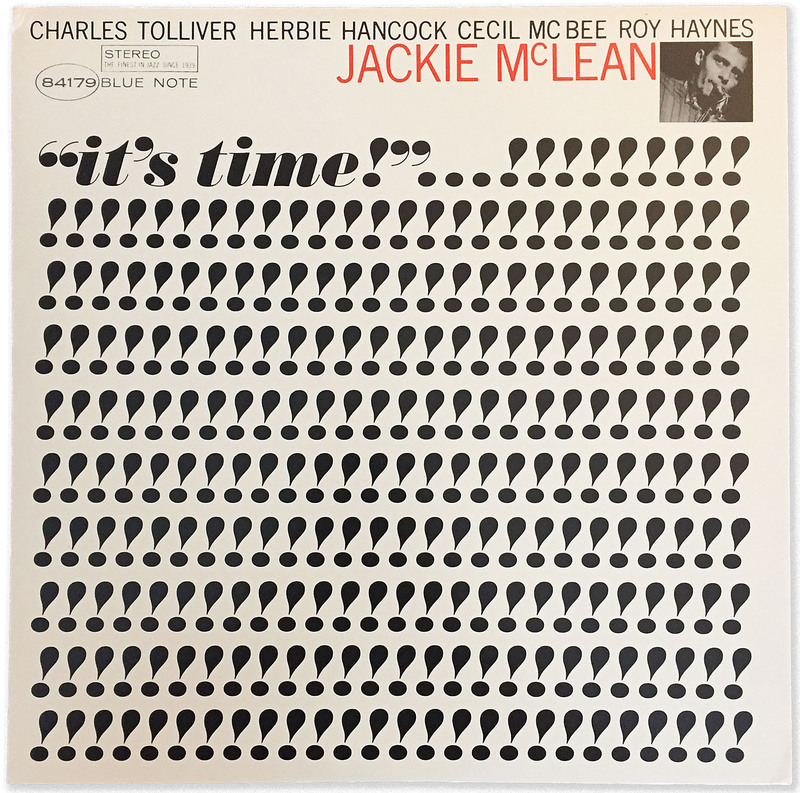 It’s Time was Jackie McLean’s tenth album for Blue Note and finds the alto saxophonist continuing a remarkable streak of wonderful albums. 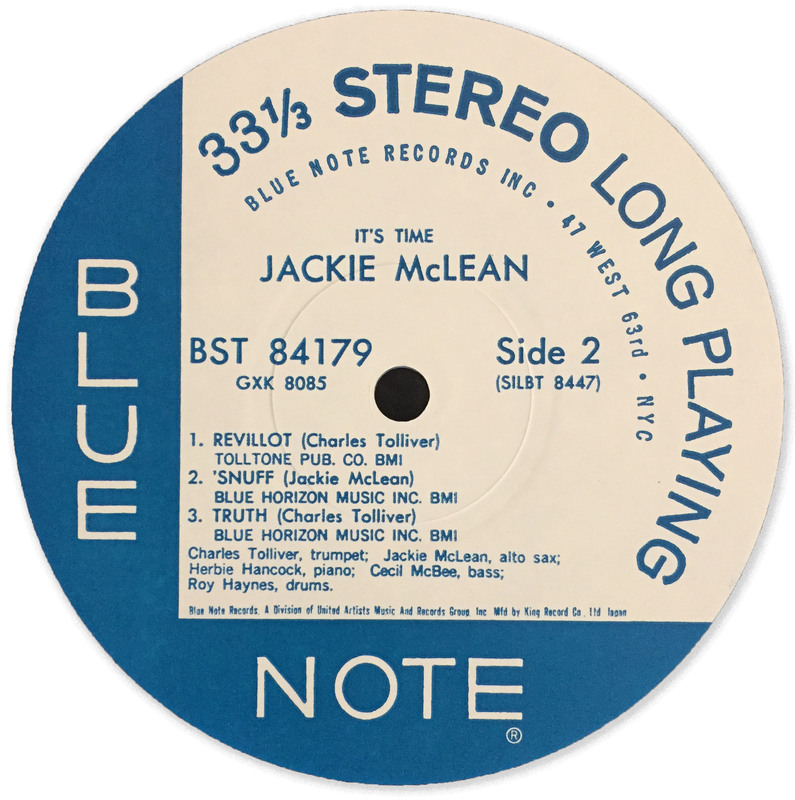 There isn’t a dud in Jackie’s Blue Note catalog up to and including the present record. Even his lesser tunes during this period would have been welcome additions to many of his stablemates’ records. One would be hard pressed to find another Blue Note artist with such consistency in his discography. His viscerally aggressive, emotional approach to both his solos and compositions. His emphasis on uptempo tunes. Jackie was never a big ballads guy, which I find refreshing. I enjoy listening to the occasional ballad, but I am generally bored by artists who spend their careers gently blowing at 40-80 bpm. I’m a guitarist, and a tone like Jackie’s is the primary reason why jazz guitar has almost always left me wanting. It’s just that I’ve never heard a guitar player—in any genre—with a tone that can remotely compete with the rawness and malleability of Jackie McLean’s alto or John Coltrane’s tenor, or the horns of countless others. Obviously, YMMV. The fact that Jackie was one of the relatively few jazz musicians of his generation to embrace the avant-garde is well-known. 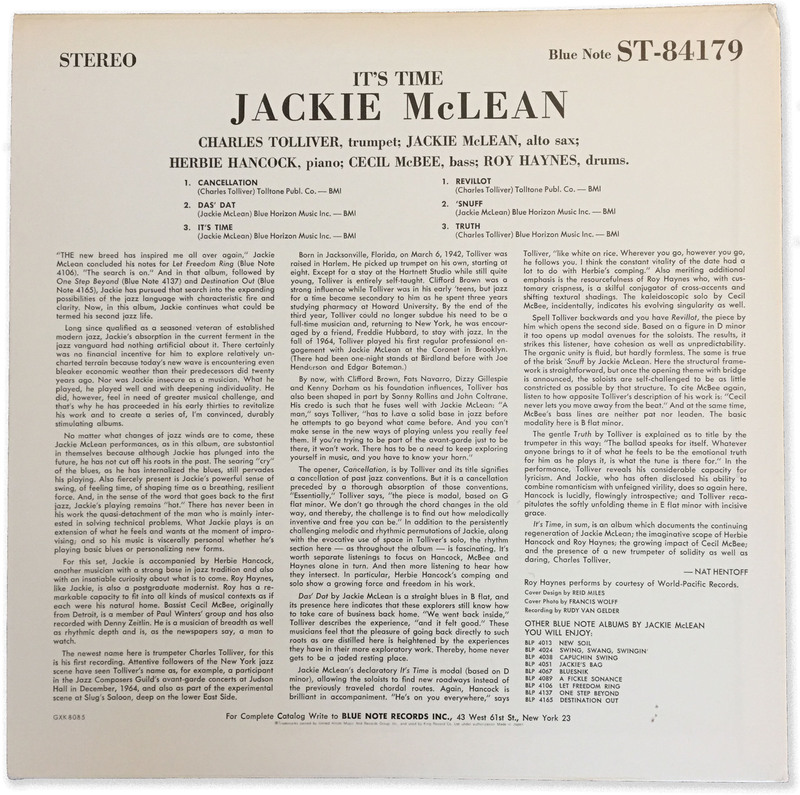 Rather than running from it like so many others did, sometimes quite literally (as when Johnny Griffin ex-patriated to France, he cited his abhorrence for the new music as a reason), Jackie made incorporating these new sounds a focal point of his career’s second act. Starting with 1963’s Let Freedom Ring, McLean assumed an altogether new modus operandi in both his compositions and his solos. Musically, It’s Time finds Jackie in familiar mid-’60s form. On Jackie’s previous two records, Grachan Moncur, III (in his compositions) and Bobby Hutcherson (in his playing) added a level of intellectual sophistication that would be hard to match. And the tunes on this record do sound a little less “out there” as a result (more accessible?). But make no mistake, this is a set of advanced post-bop, propelled mightily by a world-class rhythm section featuring the breathtaking genius of an early-career Herbie Hancock. As for the six tunes selected for this session, we have three uptempo modal tunes (“Cancellation”, “It’s Time”, and “‘Snuff”), a blues (“Das’ Dat”), a 6/8 tune (“Revillot”), and a ballad (“Truth”). Three compositions are by newcomer Charles Tolliver, and three by Jackie. At the time he recorded this, Jackie hadn’t made one of his own records with a trumpet player for a couple of years. No matter, as he and the 22 year-old Tolliver sound great together. Tolliver is a great foil for Jackie and his maturity as a composer belies both his age and the fact that this was his debut as a recording artist. 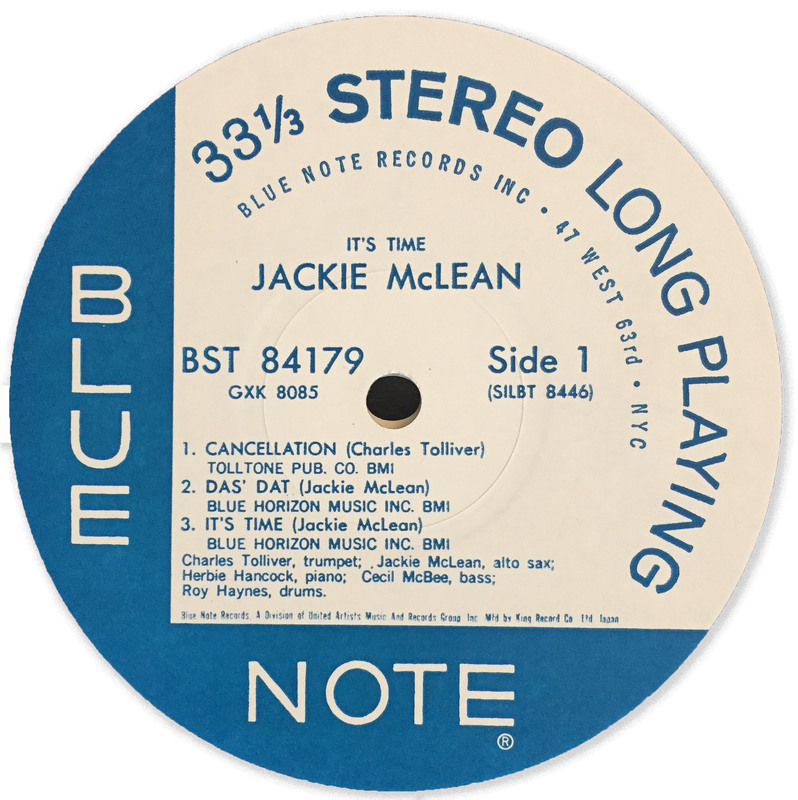 Among the various high points of this set is “Das’ Dat”, a classic Jackie Mac blues, which could have just as easily appeared on 1961’s Bluesnik. Even as he was revitalizing his sound during the mid-’60s, Jackie’s love for the familiar form of the blues never wavered. And on this track, everyone gets greasy. From his days as a teenage phenom with Miles Davis, Jackie’s virtuosity is always secondary to expressing himself emotionally. This results in a far greater use of space in his solos than just about any other saxophonist of the era. Likewise, rather than having to be the “alpha” at all times, McLean has enough self-confidence and generosity to allow his bandmates to shine. As a result, It’s Time!, like One Step Beyond and Destination…Out! before it, feels like more of a true collaboration than many other Blue Note sessions. This is a maddeningly difficult record to find, and I’ve seen very few original copies being offered on eBay. According to Discogs, there were American represses in 1967 and 1970, but after that, vinyl reissues were rare. (I’m disregarding the 1980 U.S. version, for obvious reasons.) There were Japanese presses in 1978 (this one) and 1990, but for some time, the only new reissues available were CDs. That changed in 2016 when European label Elemental Music issued the first vinyl pressing of It’s Time since 1990. 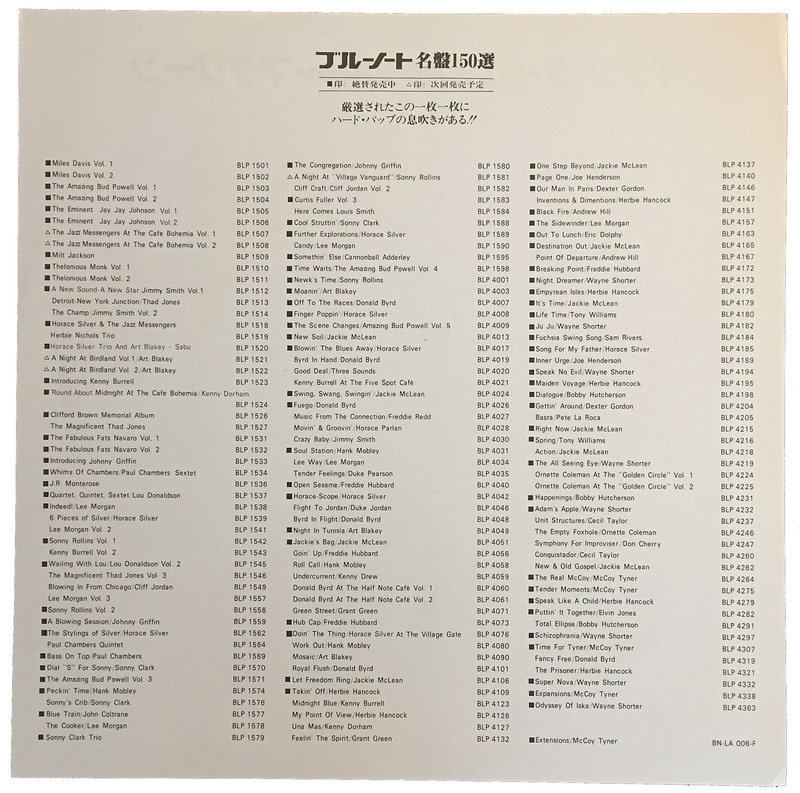 Unfortunately, from what I can gather about the company (and their website is no help on this), they appear to use digital masters, which effectively defeats the purpose of vinyl and makes them far less collectible. I’d like an original BLP 4179 at some point, but this Japanese one will do nicely for now. Mine grades conservatively at EX/EX and was surprisingly inexpensive. 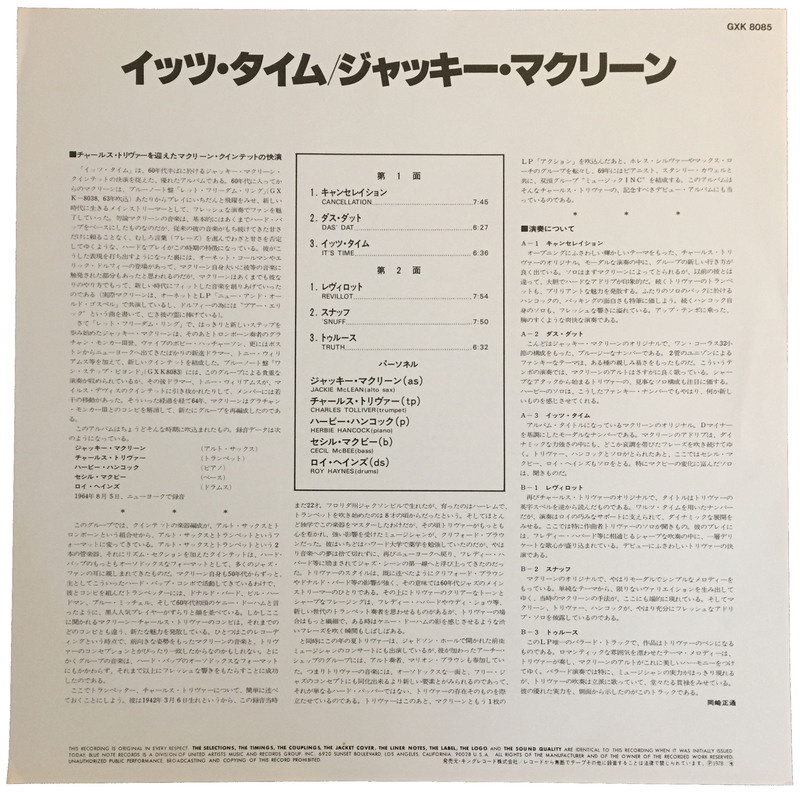 It sounds great, the King sleeve is sturdy, and the Japanese goodies (i.e., the obi and insert) add a unique level of interest. What’s not to like? In case you were wondering, there are 245 exclamation points in Reid Miles’ cover design. That’s 244 more than either Destination…Out! or Right Now! As of this writing, except for Jackie himself, each member of the quintet is still alive and active, to varying degrees. I haven’t researched the entire Blue Note ’60s catalog, but I know there are vanishingly few records from the era that, 50-plus years on, can boast of having four living members from the session. Do you have any King repressings in your collection? What about Elemental Music? Any info on them? Please share your feedback in the comments! I saw an original of this at Academy Records in Brooklyn years ago, I passed, and can’t remember now if it was mono or stereo, but a fair price tag of $75. I agree that digital vinyl defeats the purpose–ideally–I don’t know if I could tell the difference in an double blind test though. “Das Dat” is favorite cut on this, and a rare ’60s McLean cut that I actually dig. Regarding the sound of that Elemental pressing, I’m 100% certain that I’d be hard-pressed to tell a difference. But I guess that’s not the main reason that I avoid digital. Having this interest/pursuit, by definition, results in my accumulating more *stuff*. And down the line, someone is going to have to deal with it in some way, whether it’s me or whoever inherits it (i.e., my son)! Might as well maximize its “flippability”, I figure.